If however, you are looking for fascinating facts about the area then feel free to read on. Morecambe is a popular seaside destination attracting many to its wide expanse of sands and long promenade walk. Situated South of the Lake District and close to Lancaster it has long been a favourite of many a Lancashire and Manchester family, like Blackpool, and because of its rail links folk from Yorkshire and Scotland have enjoyed visiting here too. For nearly 40 years it was the venue for the annual Miss Great Britain contest, and boasted the landmark Midland Hotel on the front that was built by the Midland and Scottish railway to accomodate tourists from further afield in the UK. It is also the hometown of Eric Morecambe whose statue (picture above) graces the front. Born John Eric Bartholomew he is one half of the infamous comedy duo Eric and Ernie, and took the surname Morecambe as his stagename. Their never beaten TV ratings record still stands at over 28 million who tuned in to watch their 1977 Christmas Special Show. Bring me Laughter, all the while,"
In the past the bay has had a couple of piers and funparks but these have now closed or been demolished as the seaside trade has declined from its heyday in the 50's and 60's. New ventures have been established to try to bring more visitors back, including the restoration of the Art Deco Midland Hotel. You can however still get it's famous cockles and the local delicacy of potted shrimps, (By Appointment to Her Majesty the Queen, no less) are still available and as yummy as ever. Barrow in Furness is known for its shipbuilding and submarine yards and at one time it's deep water harbour and local iron ore deposits enabled it to grow into the worlds biggest iron and steel centre in the world, exporting steel and building ships in use all over the world. Still in use today to make submarines it houses Europes largest shipbuilding hall owned by BAE systems and was home to Vickers who employed many thousands of local people. 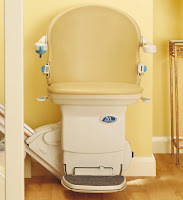 For all those locals looking for Barrow Stairlifts Remember Castle Comfort is your landmark firm for stairlifts in Barrow, Morecambe or Lancaster. Lancaster is known for its Top10 University which was the first University to have a Marketing Department and also the first University in the UK to have had mixed student residences, something which was quite controversial at the time it was introduced. The town developed as a port on the River Lune, from where it gets its name and at one time was the 4th busiest port in England. The wealth it brought into the town particularly with trade in the colonies enabled some of the residents to build large Georgian homes and some of these historic buildings can be still seen today. The town is also associated with the title of "Duke of Lancaster," who is actually the current Queen Elizabeth II. The title of Duke, (not Duchess) comes from the holdings of the Duchy of Lancaster, including Lancaster Castle, and is the land holdings that the Queen derives her income from. A little known fact is that part of these land holdings included ownership of all the seaside foreshore from Merseyside, up the Lancashire coast and north to the Furness area of Cumbria. Large interests were sold off during the nineteenth century, including the Mersey Docks and Blackpool promenade! However the Duchy still controls the majority of foreshore from the River Mersey upto Barrow-in-Furness. As with all our regional Stairlifts Blogs, we have a selection of noteable residents – past and present. It’s always remarkable, how many people do not know just who comes from their own town. Wouldn't a Stairlift on the Lancashire coast -especially Barrow would be full of sand ?